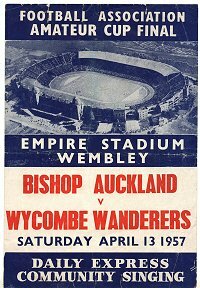 Nearly 30,000 Chairboys made the journey for Wycombe Wanderers first ever visit to Wembley Stadium hoping to see their side “Bash the Bishops” and they made up part of a huge 90,000 crowd. 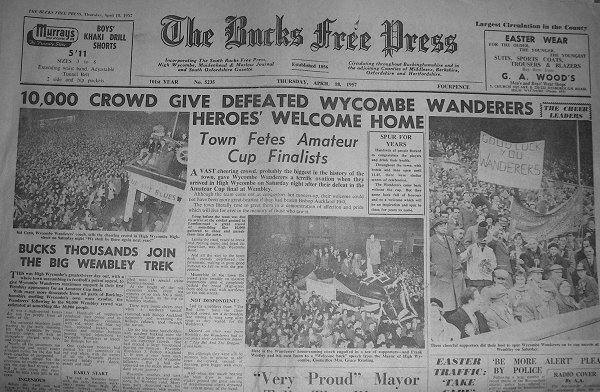 High Wycombe town centre was virtually deserted for the day, with many shops closing in the afternoon to allow their staff to travel to Wembley. Many chose to travel by one of the 14 special trains laid on and at the peak there were trains every ten minutes or so, each with around 500 passengers on board. The Bucks Free Press reported. "There were ironic cheers once when a northern special crammed with Bishop Auckland supporters and streaming the Bishops colours sped through the station.". 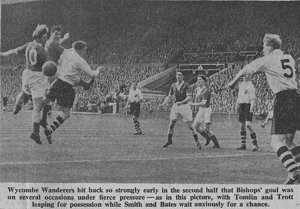 With both clubs traditionally wearing Oxford and Cambridge blue shirts - Bishop Auckland used halves and the Wanderers with their distinctive quarters - FA rules at the time meant that both teams had to change. But there was further problems as both teams wanted to wear their change colours of red shirts and white shorts. Since neither club was agreeable to change, an F.A. 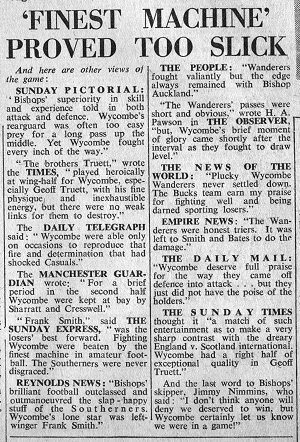 official tossed for choice with Wycombe winning and forcing The Bishops to wear white shirts with dark blue shorts. The TV cameras were there too with Kenneth Wolstenholme providing second-half commentary for live coverage on the BBC. The injuries sustained in the semi-final had all cleared up and coach Sid Cann was able to field the Wanderers strongest line-up. Bishop Auckland were nine times winners and this was their 18th final and their assurance and artistry soon showed. Wanderers, on the other hand, showed their nervousness and were guilty of some inaccurate passing. Thirteen minutes had gone when Worley’s misplaced pass found William Russell who beat Wicks before firing low across Syrett. Wanderers were under the cosh and both Russell and Edwards were denied by fine blocks from Freddy Lawson. The Wanderers held firm and battled their way back into the game. Michael Wicks header was well saved by Bishops goalkeeper Harry Sharratt before Jim Truett’s header beat Sharratt but was cleared off the line by Jimmy Nimmins. 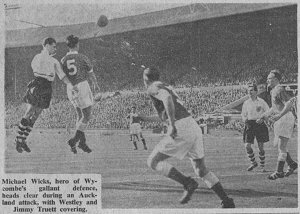 Geoff Truett played the ball into Frank Smith who dummied Cresswell and Marshall before beating Sharratt with a shot into the corner for the Wanderers equaliser, which was greeted with an ear-splitting roar. Sadly parity only lasted for two minutes; Bradley’s low cross was deflected past Syrett for Derek Lewin to score from close range. The second half started with the Bishops on top but again the Wanderers fought back. Len Worley’s point-blank shot was somehow pushed away for a corner. Sharratt then made a great save from Westley’s free-kick before denying Bates twice, running out of his area to win a loose ball and then somehow getting his fingertips to the forward’s amazing back-header. Bishops began to re-assert their superiority and began to cut through the Chairboys defence. With 19 minutes to go Wanderers failed to clear Warren Bradley’s corner and he reacted quickly to fire the loose ball through a crowd of players and into the back of the net. Jackie Tomlin managed to find the net with five minutes to go but the goal was ruled out for an earlier foul by Bates. Edwards was guilty of two glaring misses as the clock ran down. Wycombe Team: Dennis Syrett, Freddy Lawson, Frank Westley, Geoff Truett, Michael Wicks, Jimmy Truett, Len Worley, Cliff Trott, Paul Bates, Jackie Tomlin, Frank Smitm. Bishop Auckland Team: Harry Sharratt, David Marshall, Bert Childs, Robert Thursby, Corbett Cresswell, Jim Nimmins, Warren Bradley, Derek Lewin, Billy Russell, Bob Hardisty, Benny Edwards. Despite defeat nearly ten thousand lined the High Street to greet the returning team in a remarkable home-coming. The players and officials entered the street to huge roars and eventually gathered on the roof of the entrance to the Red Lion Hotel (leter to become Woolworths). Aided by amplifiers, Coach Sid Cann told the crowd below "We shall be there again next year".